As a developer, I find a lot of the ‘magical’ moments occurring from discovering new technology, platforms and applications which challenge the norm, or go beyond the tried and true to carve a path both familiar and unfamiliar to the user. While reading either Reddit or HackerNew (cannot remember origin sorry! ), I saw a comment comparing popular CMS platforms to a modern abstract interpretation: Flat-File based CMS; namely, GRAV. I decided that I’d take a look. I wanted this look to be brief, similar to how one may compare this look to a spike in a sprint, where some time is spent identifying the viability of investing further efforts and time into the task. [A flat-file CMS is] a platform that requires no database. Instead, it queries its data from a set of text files. Because there’s no database involved, a flat-file CMS is supremely easy to deploy and super lightweight in terms of size. Some flat-file CMS even run on as little as five core files. Flat-file content management systems allow for heightened speed, simplicity, mobility and security. Plus, they are an approachable solution for the less technical and underfunded. Quick Deployment: installation can be done with an FTP client alone. Site Speed: thanks to the absence of database queries, sites load a lot faster. Lightweight: flat-file platforms are typically very small in size. Mobile: because they’re so small in size and because they have no databases, moving flat-file projects from server to server is a breeze. The lack of database I found unique since this opens up potential performance benefits and NoSQL styled archiving through your own file storage; I’m a sucker for those which oppose the expected, so I was all in for trying this CMS type out. I decided to approach this overview similar to a user, instead of a developer who’d be integrating API’s and various other snippets into their project, to better understand how it compares to the average user of WordPress which powers the current site you are reading this on. Renaming the folder after extracting would have been a better idea than moving all ‘public’ files outside the folder (essentially moving the folder structure up a tree node), because one of the hidden files that I neglected the first time which was critical was .htaccess. Tested in my GoDaddy Playground domain (the-developers-playground.ca/grav/), I had to enable a few PHP modules and versions which I’m led to believe are commonly enabled by default. Not an issue, but not easily accessible to those navigating around various hosting provider’s interfaces and default configurations. Once fixing those two, the setup process for creating your website and administrative account was smooth and quick. When finished, you’ll see the admin interface similar to this which alludes to a successful setup! I’m currently playing with Grav v1.5.5, and version v1.8.14 of the Admin plugin. You can see the official ‘skeletons’ over here https://getgrav.org/downloads/skeletons, which provide a quick-start template and setup for various mediums. A nice addition for those unsure how they want to use GRAV just yet. The list goes on and on, but I listed a few that I found intriguing. I plan on playing with a few and making the currently static root for the-developers-playground.ca into a GRAV site, which will link to my experiments and work while utilizing some of the plugins. So, why did I find intrigue in a Database-less CMS? Well portability for one. If all you need is Nginx or Apache with the correct (and standardized) modules enabled, you can have everything up and running with no other dependencies or services to concern yourself over. It means that I can develop locally, and know that when I update the production side all of the data will be the same, alongside configurations, styles, and behaviors. On top of those benefits, it also meant that I could version control not just the platform, but the data using typical developer semantics. There are multiple workflows which allow for version control of content, similar to Ghost and Jerkyll which caught my attention. If you want lightweight, you can version control the /user/pages folder alone, and even utilize a plugin such as Git Sync to automatically pick up webhooks from your favorite Git Platform upon each commit. That’s one way to get those green squares, right? I see this incredibly advantageous because it allows for a much more flexible system which doesn’t dictate how items are versioned and stored, and instead treats the overall platform and it’s content similar to how a Unix system would; everything is a file. Once issue I noticed quite frequent in both the themes and plugins, is the reliance on the [insert pitchfork.gif] JQuery library for the vast majority of the UI heavy lifting. Moreso, the documentation and Discord channel appears to be quite helpful, so first impressions lead towards a developer-friendly environment where you can build out your theme and plugins when the community ones don’t fit your needs. I noticed that many of the themes can be overwritten safely (meaning you can update and not break your custom styling), which gave me the sense that there’s plenty of foundation to work off of instead of starting from a blank slate. I like that, because I really enjoyed the aesthetic of MilliGRAV, but longed for a darker theme such as my typical website. I may experiment porting my color theme over and seeing how well that goes in my next experiment with GRAV. All-in-all, I really enjoyed doing a quick sporadic walkthrough of this content management system and can see myself using it in the future when I want to migrate away from WordPress for clients and myself; perhaps even start clients there if they have less requirements and needs. I even see it coming up even sooner for static sites that need an update, and CMS integration such as rayzplace.ca which is in dire need of a refresh. GRAV would fit perfectly there. After further investigation, it appears the link above also describes a workflow similar to what I was going to suggest utilizing volumes. I’m removing my link and advocating theirs, which works. Hello there! If you’re not new to blog, or I haven’t changed any of the main headings for the website at the time of this article, you’d be aware just how big of an advocate I am of FOSS technologies on our everyday mediums. Android devices running AOSP-centric ROMs, Linux workstations running Fedora 26, and my non-FOSS hardware running as many OSS technologies as possible such as Inkshot, Visual Studio Code, Kdenlive, Firefox, etc. Ironically, the one theme which I hadn’t played with for a few years now was audio production in an open source environment. Why is this ironic? Because audio production is what first introduced me to Linux & FOSS technologies. In my cheap attempt to find a well developed & refined DAW which could be legally accessible by a high schooler, I discovered Audacity, Ardour, LMMS, and Muse; all of which pointed the way towards Ubuntu, Open SUSE, Fedora, and Linux itself. My world changed quickly from these encounters, but I always turned back to Cubase, FL Studio, Studio One when I wanted to record or mix a track for a friend. It was recorded & mixed in a Reaper session which turned out much better than expected with only the use of stock ReaPlugins. This begged the question, which would hit like a kick drum over and over all week, could this level of production quality be possible using only FOSS? Would Ardour be able to keep up with my OCD for multi-tracking even the simplest of parts? First idea is to export the Reaper stems as .WAV files into Ardour, and get a general mixing template / concept together based on previous trials / settings. This will also help me to confirm the quality of the native plugins, and if I should be worried about VST support in the case the native plugins don’t meet the sound which Reaper did. I’m both incredibly nervous and excited to see the end result, but fear that most of the time will be spent configuring & fixing JACK, ALSA, or performance issues on the Fedora machines. If all goes well, I’ll probably upload the track as a rerelease mix with the settings used & various thoughts. Recording a track natively (via MBox 2 OSS drivers) into Ardour, and compose, mix, master all using Ardour & open source software exclusively. I feel obligated to point out that if I were to use VST for any reason, they must be freeware at a bare minimum. No paid, freemium, or proprietary formats (looking at you Kontakt). I wonder if genres which don’t demand pristine sounds such as lo-fi, ambient, post-rock, or even IDM would be easier to manage compared to that of an indie sound, or a angry metal sound. My first test would be probably dwell in the electronic genre while I setup the recording interface to work best with the configuration (reducing latency where possible, dealing with buffer overflows). In this small conclusion, I simply want to list the other possible applications / technologies to consider in the case that the primary ones mentioned above do not work as intended. I’m excited for this experiment, and hope to follow up in a much more frequent article release period. My only concern is the end product, and if I’ll have a listenable song using only OSS that is not subpar in quality. Documenting the process will also help myself to understand the strengths and drawbacks to this challenge. Even if just doing a modern remix of the original track would be a unique experience, since I have all the recorded stems in multitrack format already. Can’t wait to start! Each letter in MEAN stands for the technology platform used – similar to a LAMP stack (Linux, Apache, MySQL, PHP), MEAN stands for MongoDB, Express, Angular, and Node. Luckily for me, I’ve only had to learn the basics about MongoDB and how it relates to the data you see in your various mediums. It’s a fantastic NoSQL database tool which really helped me to learn the benefits and downsides to non-relational databases in a variety of contexts. Having data saved as BSON (Binary JSON) is quite the freeing experience compared to the programmed constraints of SQL-centric databases. Being able to insert entire JSON objects, regardless of the document’s structure, allows for a much more scalable and flexible database in my opinion. Granted, this depends entirely on the purpose of the database. Need data to remain constrained to preset rules, configurations, and relations? SQL. 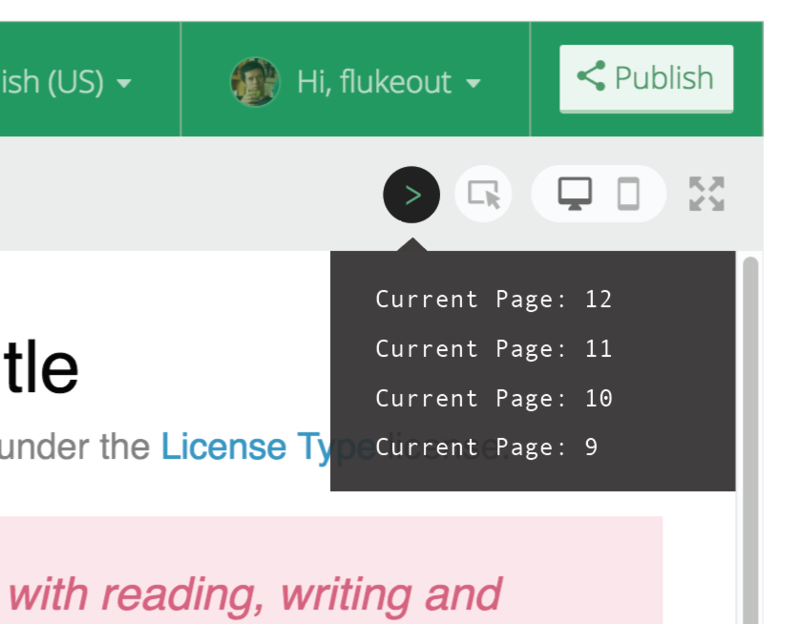 Need a place to store your marked up blog posts, or to save the comments of an article within the article structure itself? NoSQL! You wouldn’t want to save one’s most important information for example in a database which doesn’t enforce any constrains natively (though, drivers / mappers such as Mongoose do alleviate this issue very well). In this technology, I also learned how to write proper REST API programs which would power the back-end in the cleanest (at the time) way possible. I’m certain GraphQL (a newer technology which is already taking web development by storm) will become the successor to the REST API back-ends, but for my needs I’m content with the knowledge accumulated on REST practices. My URL end-points have never looked better. This semester was my first foray into Single Page Applications (SPAs), which have an internal routing mechanism allowing for a single page load to access most if not all of the views. You learn rather slowly just how powerful Angular can be from my experience, because many opinionated workflows and APIs are hidden behind a seemingly unforgiving platform complexity. Once you learn the basics, such as routing, services, components, child-views, then you realize just how much can be achieved by surrendering one’s self to such a framework. Angular 4 does have it’s limitations, and this goes back to a similar topic of ‘what is the end goal for this program’? For example, I made my life a living hell by choosing Angular for a project which really, didn’t receive any of the benefits Angular 4 could offer, simply because it was used out of ‘hype’ and not ‘logic’. Would I recommend learning / using this for other novice web developers? Absolutely! Angular 4 is a hot topic among enterprise and startups alike, and equally valuable for web applications which revolve around a SPA architecture. Working with MEAN technologies for the vast majority of the summer has allowed me to learn quite a few bleeding-edge technologies such as Web-Sockets, Webpack, Web Components, and SPA front-end frameworks. These technologies, though niche to the software developer or desktop programmer, have paved the landscape of open standards which must be supported by browsers, and likewise how one approaches the concept of a modern web application. Open Source advocates such as Netflix have contributed tens of thousands of lines of revolutionary code, all relating to the modern web & it’s various uses to the end user. I truly am grateful that I could immerse myself in such a trend which is transforming the literal internet for everyone, and though communities and developers alike are segregated on the current state of the world wide web, I am forever content knowing what I had learned, and what I was able to accomplish. This post will be one of my last related to this semester, specifically to OSD600 which has seen the class learning quite a bit about Open Source web technologies; contributing to Mozilla’s Thimble in doing so. More on such topics can be found here and there. Though I’ve mentioned my contributions before, -even sometimes becoming the main focus of an article, I thought this post would show how the console works at the current time. As of this moment, it would appear that a good majority of the first release version is complete, with UX / UI being the last remaining items that are being taken care of by yours truly, or Luke who’s a fantastic graphic designer working for Mozilla. I suppose, being honest, there’s not too much reason to be as excited or as proud as I am -but to that, I say that this has been quite the learning experience; full of new platforms and practices that I had never encountered before. I’m damn proud of what I was able to learn with the instructions of Dave, Luke, Gideon and various others this semester, and equally as proud to say that I contributed to Mozilla in a way which will help benefit users in new ways. With honesty out of the way, onto the feature set of V1! Important Note, all user interface & interactions presented below are not finalized and may change before release. 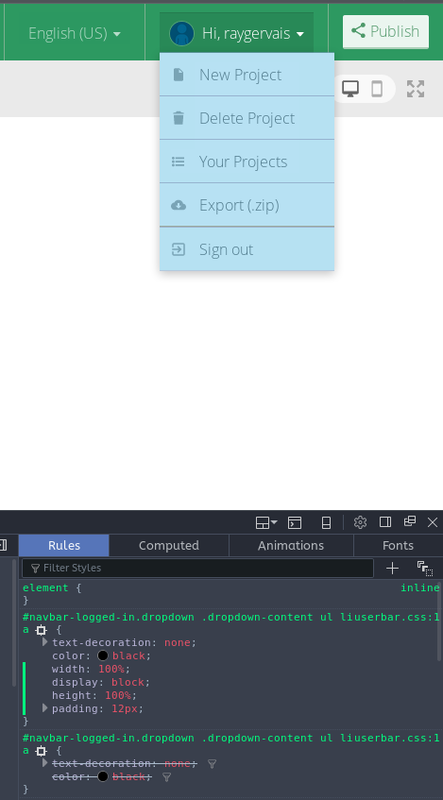 Like every good text editor, all elements and windows should be resizable to accommodate a wide variety of screen sizes, user preferences, and workflows. Thimble has been no different, which meant that this console too, had to be resizable. This is handled by a resizing plugin found throughout the project, which has made all the difference it seems when it comes to customizability and accessibility in the various toolings. What good would a console be if it only displayed your shortcomings? This console goes beyond that, allowing for one to utilize standard console functions such as log, warn, error, time, timeEnd, clear, and assert. Other functions perhaps will be added before V1.1 ;). When engulfed in a spontaneous 10-hour coding session, it’s easy for the split of a finger to cause typos, syntax errors, and inconsistencies across variable references all of which, resulting in an error being produced. In the console, the error is displayed similar to the standard stacktrace found throughout common IDEs & debugger tools. Below, you’ll see the current implementation, which is still being fleshed out. 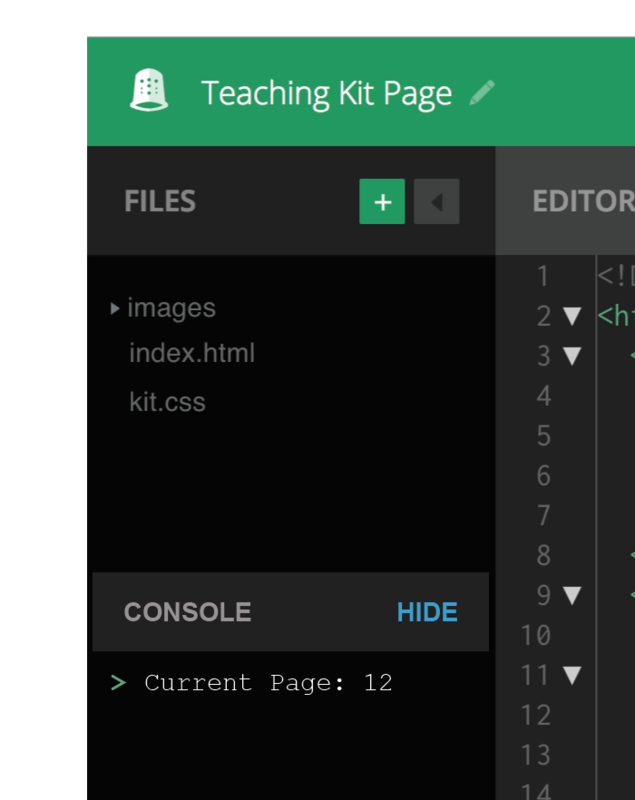 When starting returning to a project, or starting fresh with a blank template, the console does not appear. Instead, you’re presented with a toggle found in the bottom right which displays the console. Likewise, for those unaware of the toggle, the console automatically appears when a console-related function is called; convenient I’d say. If the console is instead unwanted, closing it with the close button will disallow the console to reappear until the user reopens the device. It’s amazing how, from the very start of a semester how far you can go down the wormhole, effectively specializing yourself in one of the vast code pools which make up Thimble. I would have never guessed from my first contribution that I’d be working on a console which interacts with the injected back-end code, overriding functions with replaced logic that caters to how the user would interact with the basic console. Likewise my peers, roommate even, have discovered a section of the code base that no one else in the class had. In my case, here is how I got to this point. The items in the dropdown menus only work if you click the text of the item, and not the entire length and height of the highlighted item when you hover. Essentially, this was a CSS fix, which resulted in me adding a few attributes to the a links which would fill out the list item object. A slight detour, was that when I say CSS, I mean LESS, an extension of CSS which is compiled into standard stylesheets. Having used SASS before, LESS wasn’t overly alien in syntax. When writing JS, using console.log() to check in on variable values is really handy. Opening dev tools while using thimble isn’t a good solution because the screen gets really crowded. Is there a way to intercept console.log() calls and display them in Thimble? Any other solutions, can we add support for a “thimble.log” method? These two contributions oversaw the development of the back end, which would intercept and handle the console-related functions that would eventually route said function data into the user interface. When Dave first discussed with a all-so ignorant young developer (me! ), I figured this would be cakewalk; simplistic. Within the first week, I probably inquired half a dozen times via email or the Issue page itself to figure out where to start. It was evident to everyone except myself, I was in over my head. After Dave got me on the right track, by the end of the pull request I had changed 90% of all the code that this excited developer was trying to contribute at least a dozen times. These changes were all warranted, such as eliminating repeating patterns which should become their own function, or stylistic changes which would enable the new code to sit among the rest without standing out. Why did this span two contribution periods for the class? Well avid reader, because the second period was getting the system to communicate with each other, and the third being the optimizations, extensions and testing of said functions so that the fourth contribution would consist of the user interface alone without too much backend work. The final commit count before the merge was 25 commits, which interestly spanned 71 lines being added and 4 being removed. The final stage of the console implementation was creating the interface, which I was recommended to port from a Brackets plugin. I took the later option, which would in turn endorse Dave’s lesson of ‘good programmers are lazy’; well said sir. Well said. As I started porting the extension, it dawned on me that quite a bit would be redone to make it accommodate Thimble’s interface which differed heavily in contrast to Brackets -it’s forked base. Furthermore, many of the ‘features’ had to be evaluated since they followed a workflow which did not accommodate the standard style that Thimble presented. You can see a before & after I took a crack at the interface below, with Luke’s input as well thrown into the mix. It’s not complete, but I think it’s a step in the right direction. To conclude, as I said previously, I’ve learned a lot. My peers and I have learned from those with decades of experience in the open source world; those who have helped pave the direction of many open source projects. Likewise, the code review and exposure to different toolings had enabled me to understand how Thimble’s code base -a project built on top of a plethora of other open source projects, looks and interacts as if a single developer coded every line. Learning contribution techniques specifically relating to Mozilla’s practices has also helped future proof our skill sets -that is if you share a similar belief; Mozilla’s developments and standards being the ideal technological standard for open source developers. If you’ve made it this far, I hope you enjoyed the read and get a chance to try out the first implementation of the console in Thimble. In my previous blog post, I dissected the first half of the SHA512.c implementation found in the GNU Standard C Library. The reason for such debauchery of our beloved cryptographic function? Because in attempts to optimize; I did the polar opposite. Coming to terms with such a fact is a difficult endeavour; analysing why it couldn’t be any more optimized being the only solution at the present time. So, I’ll continue from where I left off on! This function is called from the the external sha512-crypt.c file, which is a correction to my previous assumption blog post which claimed this function being called in the previously analysed source code. Instead, I’ll keep analyzing and perhaps venture into other files if time permits in follow up posts. No promises on the later statement. Assign the value of ctx->buflen to a size_t variable titled “left_over”. Create a size_t variable titled “add” which is the value assigned by a ternary operation 256 - left_over > len ? len : 256 - left_over. Perform a memcpy on ctx’s buffer at the left_over array index, using arguments buffer and add as well. If the above condition resolves to true, __sha512_process_block is called, and then memcpy is called again with multiple arguments from ctx. After that condition, the buffer is assigned to a casted const char pointer sum of buffer and add. Finally add’s value is subtracted from len. Completes the code block. Assign the sum of ctx’s buflen and add to ctx’s buflen. This is then tested against a condition seeing if ctx’s buflen is greater than 128. The next code block process the complete blocks according to the comments, with a condition checking to see if the argument len is greater than or equal to 128. The next few lines determine how a function titled UNALIGNED_P(p) should be defined, dictated by the GNUC version. Line 205 describes a while loop which processes the buffer variable in 128 bytes at a time it appears. The last code block moves the remaining bytes into the internal buffer. Going back to my original statement in part 1, it appears that if the defined SWAP algorithm could be optimized the entire process would see a performance increase. Likewise, in this entire area of functions relating to cryptography, it seems to me that memcpy could be the potential bottleneck; It is called six times throughout the file, often in loops. Another student is optimizing I believe, but I could be wrong. Looking into the while loop above, making the buffer be processed in 256 bytes at a time may be possible, but the logic would have to change to accommodate the expanded byte range. Furthermore, because this is cryptography I’m too uncertain to experiment with such modification of logic. Had I started sooner perhaps, delegated more time, or even just had more time to truly focus on the other items related to SHA512 cryptographic, perhaps I would have found a sane way to optimize the functions through inline assembly or a complete rewrite. Below are some code snippets that I came up with while testing theories and possible optimizations. Note that as you’ll see, most are minor optimizations in this case, meant to prove that the optimizations of this function lies solely with memcpy. As I go around reviewing this post, I see that the only optimizations possible were small ones which removed an addition operator. This code is highly optimized it seems. A good majority of the lack of optimizations were my own fault, the primary factor being a horrible sense of taste when it comes to choosing functions to optimize. The later, being that perhaps I did not put enough effort into this project, prioritising other projects much more in comparison. My previous function for example, segfault, contained much more potential for optimization. The better question, was what good would such optimizations do? In the end, it’s all a learning experience, and I’m glad that I was given the chance. This series of posts includes not just my admittance to failure, unable to optimize a previously selected function, but also how I learned from said failure in regards to style, logic, and also why the algorithm was already at peak performance. The catalyst to this downward spiral can be found in my previous blog post, which described my first dance with unnecessary optimizations to the segfault handler in the GLibC library. My alternative function that I had chosen was the cryptography celebrity, SHA512, which I will discuss more in detail below. After each analytical paragraph, will be an analysis as to why the that section of the SHA512 implementation in the GNU Standard C Library is already well optimized beyond what my capabilities can contribute to. For those who have a copy of the GLIBC on hand, or wish to view the code on a mirrored repository to follow along, the location of the SHA512 implementation is ~/crypt/sha512.c. The last recorded code change (that is, ignoring copyright or license updates), was five months ago, which simply adjusted the names of the internal functions to a new standard. This is the first logical segment after the C-styled includes of the endian, stdlib, string, stdint, sys/types, and sha512 header files, and to understand the first condition, a definition is needed to for Little Endian vs Big Endian, and the overall concept of Endianness. Endianness refers to the sequential order used to numerically interpret a range of bytes in computer memory as a larger, composed word value. It also describes the order of byte transmission over a digital link. Words may be represented in big-endian or little-endian format, with the term “end” denoting the front end or start of the word, a nomenclature potentially counterintuitive given the connotation of “finish” or “final portion” associated with “end” as a stand-alone term in everyday language. This format stores the greatest value’s most significant bit in the smallest possible address, with the following most significant byte preceding. The image to the side provided by Wikipedia describes how a 32-bit integer would be stored in Big Endian format, with an example from the University of Maryland providing an example using 4 bytes of data; each byte requiring 2 hexadecimal digits. Since LIBC is included 90% of the time, I think this is for the edge-case where someone compiled the crypt utilities alone. The final two lines of this function are the edge case where _BYTE_ORDER is equivalent to __BIG_ENDIAN, in which case the SWAP is defined as SWAP(n) (n). I do not see any optimizations possible here, which is due to the overall simplicity of the function. In consequence to understanding this code segment, I looked into the a great article which explains the syntax and concept behind bit masking. The bit masking allows for rearranging of the bytes themselves in a very efficient manner. Take into account unprocessed bytes by creating a uint64_t variable which contains ctx->buflen. It’s named bytes in this case. Create a size_t variable called pad, which will be used later. If the USE_TOTAL128, add ctx->total128 and the bytes variable created previously, if not, we add bytes above to the array in ctx called total. The last step, if the value we just added together in the array being smaller than the variable in step 1, is to increment the total array at TOTAL128_high by one. Here, we make pad equal to one of two conditions, based on bytes being greater or equivalent to 112. The first, is pad getting the difference of the bytes variable, and 240, the later being the difference of bytes and 112. This step processes the last bytes, calling _sha512_process_block which will be explained in the next segment. Finally, a for loop iterates through an uint64_t array called resbuf, assigning the index to the value of the defined SWAP function with ctx’s H array at the same index. A minuscule difference, is that currently the variable pad which is defined on line 136 is never used or initialized until line 147. The operations which take place in the 11 lines between the two are steps 3, which do not interact with the variable in anyway. Moving ‘pad’ to be declared before line 147 could increase compiler optimization potential, hypothetically allowing for the variable to be located horizontally in memory which would enable a lookup performance increase. Seeing the importance of the predefined SWAP function, optimizing it (if it were possible) would make the greatest difference from my overall analysis so far. These ideas is a concept mind you, meaning that I would not bet anything of value on my thoughts or my contributions just yet. They’re rough, unrefined, ignorant. Regardless, the overview is interesting, and also quite enlightening as to how cryptography in this context works, advanced bit management in C, and the coding conventions found throughout the entire Glibc. Though no segfault, no swan-song parody of a program’s best state, SHA512 is quite the hot topic as of recent with the technical blogs highlighting recent git collisions discoveries; Linus’ opinion on the matter, and how the industry itself is responding. Observing how SHA512 is implemented in C is not an item that I thought I’d be doing if ever in my programming career, but I’m damn pleased with the chance to do so. Stay tuned for my next segment, which will look over the final function in SHA512.c. This week, the class was introduced to Heroku, which is described as, “a platform as a service (PaaS) that enables developers to build, run, and operate applications entirely in the cloud”. It was a first step for many of us into PaaS concepts, along with interact with such a concept. Luckily, Heroku which is a paid service, can be used freely to open source projects such as our tutorial. Below, I’ve included Dave’s instructions which guided us through the process, along with any thoughts I had along the way before concluding with a link to my “healthcheck” function, and my repository which houses all the code. Without further delay, let’s begin. , which added the express dependency to the project. Provided with the code below, the server would utilize Express’s routing for REST API calls. I found this routing to be easy to understand, mirroring how Laravel handles API routing. My only complaint with the code below, which I sure has an answer for that I have yet to discover, is the lack of organization. All the API routings are displayed in the single file, which in this case is easy to read, but what of bigger projects? // email address is valid or invalid. // formatted as a valid email address.
. If all is successful, you can access the server through http://localhost:3000/, and test your previously implemented functions through ~/validate and ~/format. If working, the server will return a JSON response. , providing the credentials created previously. The next step for this item would be creating the Procfile, which describes to Heroku which command to run when running the application. if you wish to visit your application’s domain in the browser. My REST API for this tutorial can be found at this link. This was my first introduction to utilizing a PaaS both in an open source context, and a developers. Every week, It seems that I’m introduced into another universe, driven by technologies and platforms, names and languages; all of which I had never heard before. Last week I learned of TravisCI, and this week’s introduction to Heroku only expands upon an already interesting set of topics which are beyond the reach of the standard curriculum. Curiosity demands my exploration of Heroku, and perhaps for future endeavors into REST APIs will be powered by the platform. Only time will tell.